Earlier this month, we hosted our SpotX Hackathon event at the company headquarters in Broomfield, CO. With the theme, “Sustaining our Communities,” the participants focused on environmental, social, and infrastructural factors that contribute to sustainability in Colorado. As a longtime supporter of National Center for Women & Information in Technology (NCWIT), SpotX’s own women in tech organized the event to support women in technology with a “green” twist. This event brought together a diverse group of people in the industry of all skill levels to tackle important environmental and sustainability issues in the Denver community. The SpotX Hackathon consisted of seven teams of coders who spent the day working on technology solutions for sustaining various aspects of our local community. First place was awarded to Good Works, a team that created a community app where users can log public issues in their communities. This also allowed someone else to view the task in the app, complete it, and gain points for rewards. Not only would this app help fix problems throughout the community, but it would get community members directly involved in improving the quality of life of those around them. Second place went to OfficeCycle, a team that created an app which allows you to enter an item you want to recycle, and the app will tell you if you can or not. Sustainable living is increasingly becoming top of mind for people around the country; however, the lines between what must be thrown out versus what can be recycled or composted can be confusing. This app would help ensure that community members are properly recycling items in their home or office for more sustainable living. Third place went to the Farmer’s Market, an app that compared farmers’ markets zoning to density of population, that allows users to look to and see where you might want to start a farmer’s market. The benefit of this app for users would be to get community members directly involved in developing their neighborhood by supporting local farmers and businesses. The whole event was organized by a team of SpotXers and sponsored by local partners, including Oracle, Return Path, Sparkfun, Dell, Visible, Webroot, and Zayo. 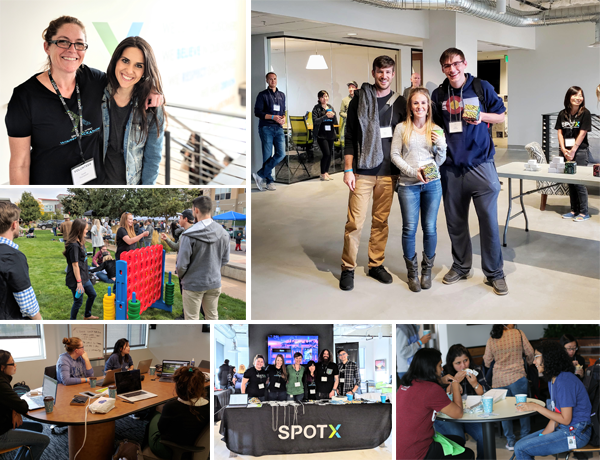 Celebrating women in technology was an important element of the hackathon, and the SpotX team was thrilled that participants could spend the day learning from and networking with successful women in various aspects and industries within technology. Thank you to all the sponsors, participants, and our team members who made the SpotX Hackathon powered by women a success! Click here to learn more about upcoming SpotX events.